August 12th to September 2nd: 10% discount if you stay 5 or more nights. Cleaning fee required –Waived if you stay 7 or more nights! Deposit (less a 30% service charge) refunded only if 30 days cancellation notice is given and full reservation is re-rented. Deposit will not be refunded if less than 30 days notice. You are responsible for the total number of nights reserved. Cleanliness is important to us, and to you! To ensure all condos are properly prepared, we request NO EARLY ARRIVALS OR LATE DEPARTURES during peak season. Sorry, not even to put your boat in! Only exceptions will be with prior approval and additional charges of $20 per hour. Boat Slip Rental: Covered, padded, well lit with electric hook-up in a quiet cove. 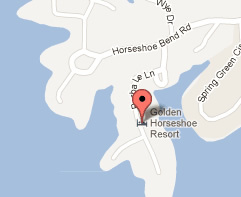 89 Octane gas available at a competitive price at the Golden Horseshoe Condo Rentals. Quiet cove.